Life often seems to be a series of events that are totally unexpected. But if you could look at it all from a distance, as an outsider, even briefly, these events wouldn’t be unexpected at all. 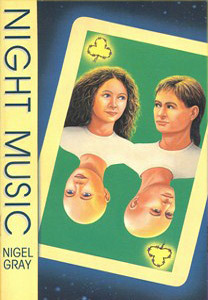 Night Music is no ordinary ‘young adult’ story of bad skin and back seats. It’s the story of two kinds of love, both wonderful and difficult: first love and the love that can bind a family together. And it’s a story of commitment and courage.